To produce components to control fluid flow, that will always orientate in the same position, give rapid movement in / out with minimum rotation resulting in finite control of the fluid flow. The tolerances governing the fit of the mating fit of parts to ensure “tactile” feel to the user is always good. To manufacture tooling to produce two off components to the tight tolerances required. Enabling the requirements to be met. The first tool was designed to produce the drive component with an internal multi start Left Hand Thread. To ensure the stop start is always engaged in the correct position one thread is deliberately omitted. The six start thread allowing rapid forward and back transition of the mating part with minimum rotational turn of the component. The second tool was designed to have an external multi start thread with one thread omitted. This, when mated with the first component gives the “dead on” alignment and quick transition. 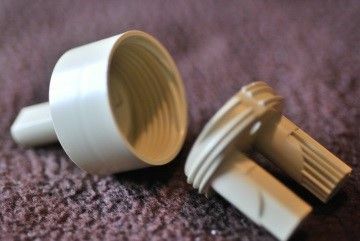 To overcome the undercut issue caused by forming a multi-start external thread in plastic, AKI removed the area of undercut created at the split line by coring it out, thus removing the undercut area. The Flow is controlled with a profiled varying set of splines that is made up of over 20 inserts with different “spline” profiles machined in to them.